• patterns of morphology and syntax. The site may be useful to those interested in Malay studies (including literature, history and culture) and linguistics. Alphabetical as well as chronological lists of texts are available for searching. It is also possible to search for single words or complex conjunctions of words. For copyright reasons, texts are not available for downloading as full texts. If search results from the MCP are being used in publications, the author must acknowledge the project in the footnotes and bibliography of their publication. An exquisite illuminated Qur’an (Or.15227), dating from the 19th century and originating from the East Coast of the Malay peninsula, is the first Qur’an manuscript in the British Library to be digitised in its entirety. The manuscript was displayed in the British Library’s Sacred exhibition in 2007, and also featured in the accompanying book by Colin Baker on Qur’an manuscripts. On the basis of various codicological features the manuscript can be attributed to the cultural zone encompassing Kelantan, on the north-east coast of Malaysia, and Patani, in southern Thailand. In many ways the Qur’an is typical of manuscript production in Patani, with black endpapers of Thai manufacture, a cloth cover with elaborate stitched headbands, and illuminated frames with typical Patani features such as the ‘interlocking wave’ motif. And yet the exactitude of the drawing and colouring, and the repetition of ornamental details, is more typical of Qur’ans from the court of Terengganu, the richest centre for Islamic manuscript illumination in Southeast Asia. 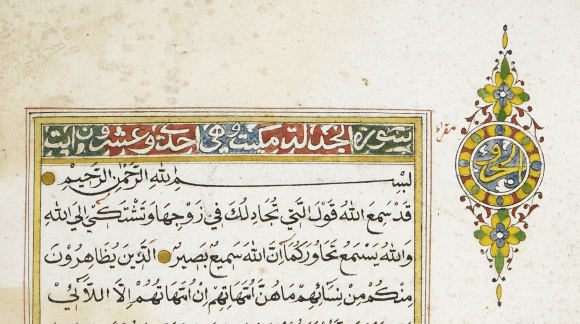 The hybrid character of this manuscript is emphasized by some other unusual features, including the presence of double decorated frames in the middle of the Book marking the start of Surat al-Kahf and Surat Yasin, instead of just at the beginning of Surat al-Isra’, as is usual in East Coast Qur’ans. Also of great interest are two unfinished monochrome frames in black ink (ff.303v-304r, 306v-307r); the zoom capabilities of the digitised manuscripts viewer can be used to follow how the artist worked. 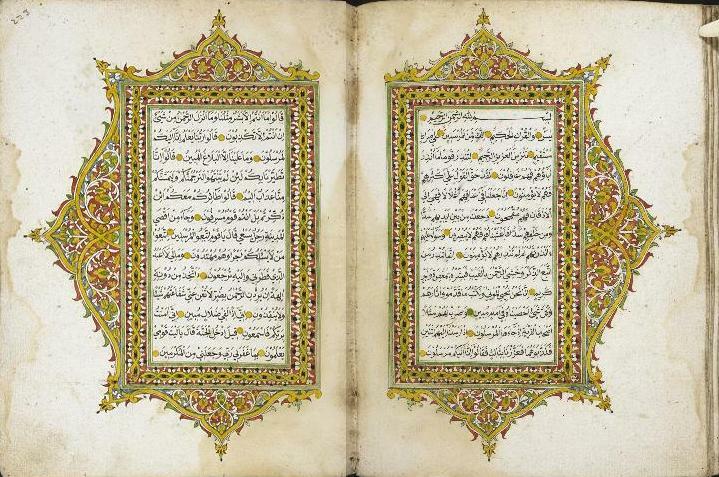 The British Library Malay Qur’an joins other fully digitised Southeast Asian Qur’an manuscripts on the internet, including a superbly illuminated Acehnese Qur’an, Cod.Or.2064 in Leiden University Library, and four Javanese Qur’an manuscripts (Arabe 458, 582, 583 and 584) in the Bibliothèque nationale in Paris. Thus for the first time, it is possible to study online Qur’an manuscripts from three distinctive regional traditions in Southeast Asia. Annabel Teh Gallop, ‘The spirit of Langkasuka? illuminated manuscripts from the East Coast of the Malay peninsula’, Indonesia and the Malay World, July 2005, 33 (96): 113-182, pp.146, 161. Colin F. Baker, Qur’an manuscripts: calligraphy, illumination, design (London: The British Library, 2007), pp.92-93.